While researching for some weight loss books in the market, I was surprised to find a book written about the Buddha’s diet called Buddha’s Diet: The Ancient Art of Losing Weight Without Losing Your Mind . Personally, I have not read the book but I’ve had personal experience of following the diet similar to what was practiced during the Buddha’s time, minus the ascetic ways. In Thailand and for those practicing Theravadian Buddhism, monks, nuns and sometimes laypeople practice this. For lay Buddhist preceptors, it would be part of the 8 precepts practice. In fact, I was on this diet for more than a year. I want to share my experience of this diet firsthand. In the year 2008 after I left my job, I stayed almost a year in Thailand. Most of the time, I observe the diet requirement found in the 8 precepts of Buddhist practice. Meaning, I can eat as much as I want for breakfast and generally I would take my lunch at about 11am. Then no solid food after that till the next day when the sun comes up. However, the above may vary from temple to temple which requires this diet for their monks, nuns, as well as lay persons observing 8 precepts. Yep, I know some of the food above were not found during Buddha’s time but from interpretation of the scriptures, new food were introduced under the ‘allowed’ list (example cocoa and coffee). Do note that the above are more of observations by non ordained persons who wishes to extend their observation to deepen their spiritual practice. 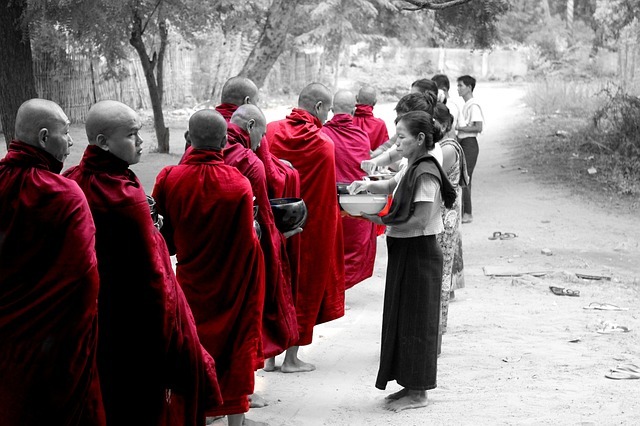 Monks on the other hand, observe 227 precepts and if they follow a more stricter rules. for example, by not eating solid food after noon does not mean you can eat as many times as you want before that. A friend of mine would eat breakfast, then snack for two times and then have lunch. As part of the practice is also to deal with cravings with regards of food, we should stick to eating breakfast and lunch. have the food you want in front of you. Once you start eating, if you realized you forgot to take something (like a dessert or some sauce), the moment you get up …. you should not be eating anymore. This is aimed to help us let go, be more mindful (remember to place what we want) and disciplined. I remembered sometimes halfway when eating when it suddenly rained, one would have to run to get the clothes (that time we did not have awning to protect the clothes and we had limited clothes to wear so we can’t really afford to get our clothes wet in the rain) and ….since the person got up, then she would not eat after that. we also should take our food and drinks with respect. We should not talk with food in our mouths and when we are taking a drink, we should sit down instead of walking and eating. If one does not take solid food after noon, does it means one eat a lot before that? Initially when people are not used to the diet, they would tend to load up a lot of carbo (like rice and snacks) for fear of being hungry. However, the more you load up on carbs, the hungrier you may probably get in the afternoon. So after a while, we tend to eat lesser…. however we still would take more food for our breakfast and lunch than a person who is eating dinner would. Many people I know thought they would not be able to survive without solid food after noon, having never tried it before in their life. However, often they surprised themselves that they could (sometimes it takes a few days for their body to adjust). With the combination of the 8 precept diet, and learning to let go, I lost about 12kg without much effort. Is it possible for those with health ailments like diabetes to observe this diet? I have known some who are diabetic and some high blood pressure who could observe the diet successfully…. in a spiritual environment while staying in a temple with others who are also observing. They could do it because they are spending their mind on spiritual practice and often it can override their bodily symptoms. Their mind calms down and their blood pressure or blood sugar does not go out of whack due to stress. However for diabetics, they cannot load up on carbs when taking their morning meals. Also, once they are back to their pressurized world, they should go back to their normal diet. I adopted this diet (with some adaptations) for almost a year when staying in Thailand. I then continued this diet for 1.5 years after coming back to Malaysia. Instead of no solid food after noon, I practiced no solid food after lunch because my lunchtime was often after noon. I also followed the allowed drinks and food but for coffee, I had 3-in-1 or sometimes with condensed milk. My colleagues were not aware about my diet. I did not want to explain or justify my choices to others so except for my family and long time friends, no one knew. Often my colleagues who saw me have my lunch would widen their eyes in disbelief or shock because the food portion I was eating was bigger than usual and they wondered how come I could eat so much and not put on weight. It was just that if there are cakes or goodies being passed around during afternoon tea, I either would offer it to someone else or politely accept and eat it the following day for breakfast or take back for my family. My company did organize dinners from time to time or sometimes friends would ask me out- but I stuck to having only sweetened drinks. Many people may find this way of eating as being a little unusual. I was able to practice it because I was used to it and due to my own religious convictions. It is the same that I observe among my Muslim friends who fast during the month of Ramadhan. I am always amazed because during that month, even my chain smoking friends can just stop cold turkey and those who could not live without food could fast the entire month. When I asked a Muslim friend of mine on their secret, she told me it was ‘niat’ or the intention to observe fasting that is based on their faith and conviction. I realized it was the same for me….that the reason I could stick to the diet even though after I came back and no one around me was on the diet was due to my own spiritual convictions. It is terribly hard to stick to a diet plan using the sheer grit of willpower and persistence. When I was on the 8 precept diet, it did not feel like I had to grit my teeth or force myself…. that time I was used to it and it was as if a part of my life. Hence, logically I would think it would not be easy for anyone to just follow a 8 precept diet or some form of intermittent fasting if there is no element of spiritual or religious conviction being involved. I do know of yoga teachers who are able to fast but their purpose seemed to be more for health and detox. However, I also felt that these teachers seemed atuned to their bodies and/or the energies of the universe (new age). For me, this was the diet that I had the most success with, where I generally eat proper food during lunch and successfully resisted the temptation of snacking. But eventually I went off the diet as my teacher advised me to do so- she said I was in a pressurized corporate environment and needed to use my brain resources a lot. Hence, I should continue to take proper solid food like dinner.